“You think you need thousands of dollars to invest, it's for the rich folks...not the case anymore because there's Acorns." “Acorns is my favorite money app, because it makes it simple and cheap to make small investments." “Investing is one of the most effective ways to build wealth. With Acorns, you can start with your 'spare change.'" Imagine if you could invest in your future without really noticing. Sign up in under 5 minutes and join over 4,000,000 people! Set aside spare change or extra cash as you go about your day with Round-Ups and Recurring Investments. Get the easiest IRA, Acorns Later, and save for retirement without thinking about it. Sit back and let your money grow over time in diversified portfolios constructed by experts. Pre-order the only checking account with a debit card that saves and invests for you, plus no minimum balance or overdraft fees. The more you earn, the more you can save and invest! Grow faster with these 250+ top brands that invest in you when you shop. Original content right in your app helps you grow your money knowledge on the go. 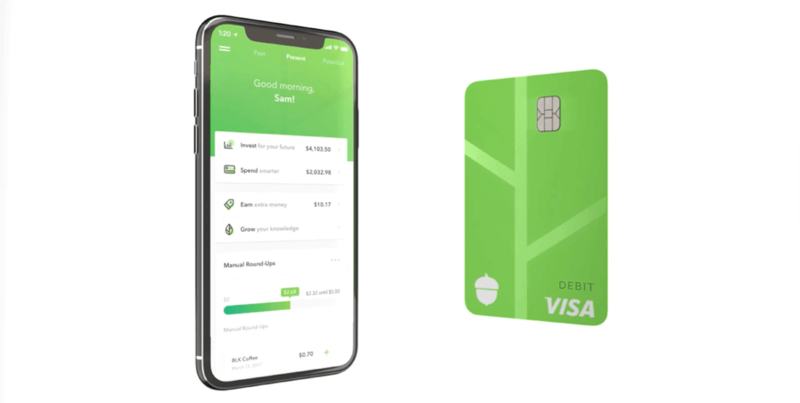 Pre-order Acorns Spend now and tap into the full Acorns financial system. All of your data is protected with 256-bit encryption and never stored on your phone, tablet or computer. Acorns Securities, LLC is a Member of the Securities Investor Protection Corporation (SIPC) which protects securities customers of its members up to $500,000 (including $250,000 for claims for cash). Explanatory brochures are available upon request or at www.sipc.org. Acorns is just $1, $2, or $3 per month. No surprise fees, just surprise upgrades. For more, check out our pricing page.